Prettig sinterklaasfeest! Happy St. Nicholas Day! Enjoy the fest with these traditional Belgian spice cookies. 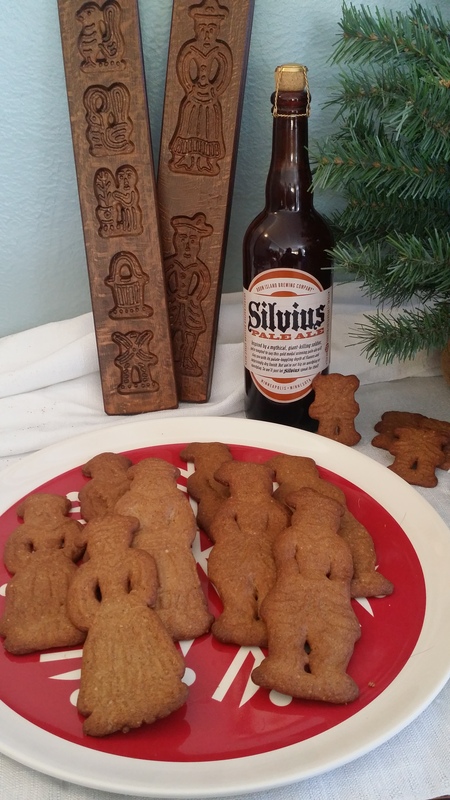 Usually folk enjoy them with a cuppa tea or coffee, but we felt Silvius was a little more festive. * almond meal or almond flour is readily available at most grocery store. To make your own, pulse about ⅔ cup sliced or slivered almonds with 1 Tbsp flour in a blender or food processor until finely ground. Cream together the butter and sugars until fluffy and well combined. Add the eggs, one at a time, beating until just combined. In a second bowl, whisk together the flour, almond meal, baking soda, spices and salt. Gradually beat the flour mixture into the butter mixture until just combined. Turn dough out onto a lightly floured surface and knead slightly. Divide dough into 2 portions. Roll into a ball, wrap in plastic wrap and refrigerate overnight. On a lightly floured surface, roll the dough out ¼ inch thick. Cut using cookie cutters. Arrange on a lightly greased cookie sheet, spacing the cookies at least an inch apart. Alternatively, press the dough into a cookie mold to shape. 10 to 15 minutes, or until cookies are browned and slightly crisp.